Are you looking to give your home an update with a new splash of color? Then look no further, Certified Painting Professionals is your Brentwood, MO professional painter. Rather you are looking to update your basement, kitchen or living room we will help you through the process. Our professional painter in Brentwood, MO will meet with you to discuss your desired outcome and project objectives. During this process we will give you and estimate based on the work that is needed. From there our crew will start working on the agreed upon start day. On the last day, we will do a walk through with you to ensure that the job is done to your satisfaction. Our crew receives raving review from our clientele based on the work they do. Please view what some of our customer said about us. 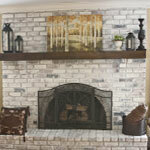 If you are looking for a professional painter in Brentwood, MO then look no further. Certified Painting Professionals has you covered. Give us a call today to receive your free estimate: (618) 560-7030. Looking for a painter in Brentwood, MO? Certified Painting Professionals is the team you are looking for. We have experience in painting walls, fences and decks among many other areas of the home. Below are some of the services that we offer, but not all. If you do not see what you are looking for, please give us a call at (618) 560-7030 and we will be happy to discuss your project with you. Below are the Most Common Painting Services for Brentwood Missouri. Certified Painting Professionals is your exterior home painter in Brentwood, MO. We paint all types of exterior homes including (but not limited to) bricks, stucco, and wood siding. We also paint doorways, shutters, and garages. Whitewashing is a popular trend in today’s era and one that we personally love. Whitewashing is taking your brick and adding a light touch of watered down white paint that allows the brick to still be seen with a faded white color. If you are unsure of what White Washing is then check out the photo above. 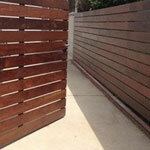 We specialize in painting and staining fences. There are many different options when it comes to staining and painting your fence. You can choose to paint your fence white to give the traditional feel or go a little darker for a more modern design. Interior walls are the most requested jobs that we get. Changing the color of your wall can make a big difference in the overall appearance of your home. There are so many different colors of paint that you can choose from that will dramatically change the overall appearance of your home. Just ask, we will be happy to help you choose a color for your home.